Spring, summer, fall and winter: the four seasons of the year. 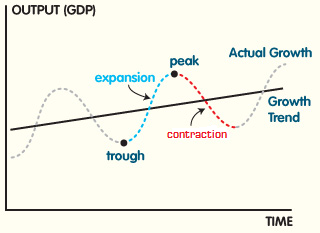 Expansion, peak, contraction, trough: the four seasons of an economy. In this next section you’ll learn about the cyclical nature of economies and how each of these “seasons” affects business operations. The term economic cycle (or boom-bust cycle) refers to economy-wide fluctuations in production, trade, and general economic activity. From a conceptual perspective, the economic cycle is the upward and downward movements of levels of GDP (gross domestic product) and refers to periods of expansion and contraction in the level of economic activities (business fluctuations) around a long-term growth trend. Economic cycles are identified as having four distinct economic stages: expansion, peak, contraction, and trough. An expansion is characterized by increasing employment, economic growth, and upward pressure on prices. A peak is the highest point of the business cycle, when the economy is producing at maximum allowable output, employment is at or above full employment, and inflationary pressures on prices are evident. Following a peak, the economy typically enters into a correction which is characterized by a contraction where growth slows, employment declines (unemployment increases), and pricing pressures subside. The slowing ceases at the trough and at this point the economy has hit a bottom from which the next stage of expansion and contraction will emerge. In the United States, it is generally accepted that the National Bureau of Economic Research (NBER) is the final arbiter of the dates of the peaks and troughs of the economic cycle. Since the economy is made up of businesses (both private and public), businesses are impacted by the stages of the economy or perhaps they cause the stages of the economy – or maybe a little of both! When we move from talking about stages of the economy, the terms used to describe the business cycle differ slightly, but you will see that they are almost mirror images of the economic stages. Business cycle fluctuations occur around a long-term growth trend just like economic cycles, but unlike economic cycles they are measured in terms of the growth rate of real gross domestic product (Real GDP). This does not mean that the GDP is imaginary, but rather that GDP does not take into account inflation. Instead, real gross domestic product is the inflation adjusted value of the goods and services produced by labor and property located in the United States. An expansion is the period from a trough to a peak, and a recession is the period from a peak to a trough. 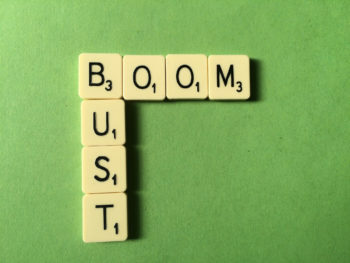 The NBER identifies a recession as “a significant decline in economic activity spread across the economy, lasting more than a few months, normally visible in real GDP, real income, employment, industrial production.” This is significantly different from the commonly cited definition of a recession being signaled by two consecutive quarters of decline in real GDP. If the economy does not begin to expand again, then the economy may be considered to be in a state of depression. How the economic cycle affects business operations may be best explained by looking at how one business responds to these cycles. Normal Maintenance is a small business that provides a variety of construction services to homeowners. They specialize in roofing, deck installations, siding, and general home maintenance. They employ three full-time workers, who typically work forty hours per week for an average of twelve dollars per hour. 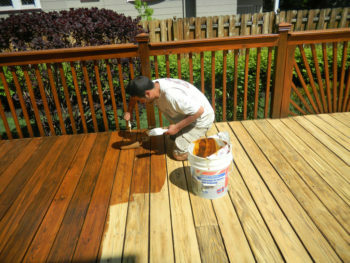 The company has been in business in the same town for than twenty years and has a solid reputation for quality work and reliability. Normal Maintenance is busy and has recently had to turn down jobs because it lacks the capacity to do all the work offered. Homeowners now want to make home repairs and improvements which they had had to put off during the sour economy. With the economy improving, others are fixing up their homes to sell. Faced with so much demand, the owner of Normal Maintenance must decide whether to pay his existing workers overtime (which will increase the costs for each job and reduce profits) or hire additional workers. The competition for qualified construction labor is steep, and he is concerned that he will have to pay more than his usual rate of twelve dollars per hour or possibly get workers who are not as qualified as his current crew. He is, however, able to charge higher prices for his work because homeowners are experiencing long waits and delays getting bids and jobs completed. The owner purchases a new truck and invests in additional tools in order to keep up with the demand for services. Customers are willing to pay more than usual so they can get the work done. Business is expanding to such an extent that Normal Maintenance and its suppliers are starting to have trouble obtaining materials such as shingles and siding because the manufacturers have not kept pace with the economic expansion. In general, business is great for Normal Maintenance, but the expansion brings challenges. At the peak of the business cycle, the economy can be said to be “overheated.” Despite hiring additional workers, the owner and crews of Normal Maintenance are working seven days a week and are still unable to keep up with demand. They can’t work any harder or faster. As a result, the crews are exhausted and the quality of their work is beginning to decline. Customers leave messages requesting work and services, but the owner is so busy he doesn’t return phone calls. Jobs are getting started and completed late as the crews struggle to cover multiple job sites. As a result, customer complaints are on the rise, and the owner is worried about the long-term reputation of the business. Neither the business nor the economy can sustain this level of activity, and despite the fact that Normal Maintenance is making great money, everyone is ready for things to let up a little. As the economy begins to contract, business begins to slow down for Normal Maintenance. They find that they are caught up on work and they aren’t getting so many phone calls. The owner is able to reduce his labor costs by cutting back on overtime and eliminate working on the weekends. When the phone does ring, homeowners are asking for bids on work—not just placing work orders. Normal Maintenance loses out on several jobs because their bids are too high. The company begins to look for new suppliers who can provide them with materials at a cheaper price so they can be more competitive. The building material companies start offering “deals” and specials to contractors in order to generate sales. In general, competition for work has increased and some of the businesses that popped up during the expansion are no longer in the market. In the short term the owner is confident that he has enough work to keep his crew busy, but he’s concerned that if things don’t pick up, he might have to lay off some of the less experienced workers. On Monday morning, the crew of Normal Maintenance show up to work and the owner has to send them home: there’s no work for them. During the week before, they worked only three days, and the owner is down to his original crew of three employees. Several months ago he laid off the workers hired during the expansion. Although that was a difficult decision, the owner knows from hard experience that sometimes businesses fail not because their owners make bad decisions, but because they run out of money during recessions when there isn’t enough customer demand to sustain them. Without enough working capital to keep the doors open, some are forced to close down. Representatives from supply companies are stopping by the office hoping to get an order for even the smallest quantity of materials. The new truck and tools that the owner purchased during the boom now sit idle and represent additional debt and costs. The company’s remaining work comes from people who have decided to fix up their existing homes because the economy isn’t good enough for them to buy new ones. The owner increases his advertising budget, hoping to capture any business that might be had. He is optimistic that Normal Maintenance will weather this economic storm—they’ve done it before—but he’s worried about his employees paying their bills over the winter. The owner of Normal Maintenance has been in business for a long time, so he’s had some experience with the economic cycle. Though each stage has its stressors, he has learned to plan for them. One thing he knows is that the economy will eventually begin to expand again and run through the cycle all over again. If the economy is currently experiencing high growth and inflation combined with low unemployment, it is likely to be at which phase of the business cycle? b. Expansions tend to be characterized by positive GDP growth and decreased unemployment and increasing inflation.